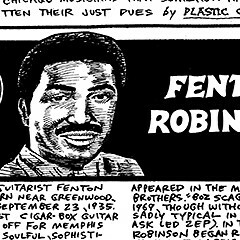 Soft-spoken guitarist Fenton Robinson sometimes seems to kindly for the competitive world of Chicago blues. He holds his instrument tenderly, at an angle remindful of jazz or classical guitar playing, and his leads ripple out over the top in smooth, undulating phrases. Robinson's supple, evocative voice fills out the picture--it's best suited to ballads, like the standard "As the Years Go Passing By" or his plaintive trademark "Somebody Loan Me a Dime." Robinson sometimes relies a bit too much on his sweet side; especially in live performance, you often wish he'd pour a little more grit into the mix, and his laid-back sophistication sometimes teeters on the verge of detachment. But when he's got the right musicians behind him, and when the venue inspires him sufficiently, he's capable of a show that's both heartbreaking and surprisingly uplifting--there's an aching beauty to his work that infuses even the bleakest ballads with hope. Saturday, Buddy Guy's Legends, 745 S. Wabash; 427-0333. Art accompanying story in printed newspaper (not available in this archive): photo/Paul Natkin. This soulful, sophisticated blues guitarist is best remembered for the slow burner "Somebody (Loan Me a Dime)."